Murphy Orthodontics, with offices in the Phoenix and Goodyear area, has moved their Goodyear location to a new facility. Goodyear, AZ – Dr. Chris Murphy, the head of Murphy Orthodontics, is announcing the relocation of his Goodyear office to a new facility just a few miles away. While Dr. Murphy’s Phoenix office is staying put, his Goodyear office has moved to a new, upgraded facility located at 14553 W. Indian School Road, Suite 100. The new office, near the Eagle’s Nest Golf Club, is open and accepting patients. The Phoenix and Goodyear Orthodontist says the new facility has been specifically designed to provide patients with a relaxing, comfortable environment, while offering the same comprehensive range of treatments that were available at the previous Goodyear location. He notes that the facility is state-of-the-art, and serves as a convenient option for individuals in the Goodyear area who are looking for advanced procedures to address an array of common orthodontic concerns, whether mild or severe. Murphy Orthodontics offers treatment for both adults and children who need effective solutions for teeth misalignment, bite issues, and other irregularities affecting the jaw and teeth. The practice offers a full selection of braces – including HARMONY Lingual Braces, clear braces, and the Damon® System – as well as treatments such as Invisalign® and others designed to correct orthodontic problems in the most discreet way possible. Dr. Murphy says the new Goodyear location is an excellent complement to his expansive office in Phoenix, offering both existing patients and new patients a comfortable, advanced facility to obtain the treatment they need from a dedicated team of orthodontic professionals. Dr. Chris Murphy is a Diplomate of the American Board of Orthodontics and a Recognized Specialist at the Kois Center. He is also a member of the American Association of Orthodontists, the Pacific Coast Society of Orthodontists, the Arizona Orthodontic Study Group, and the American Dental Association. 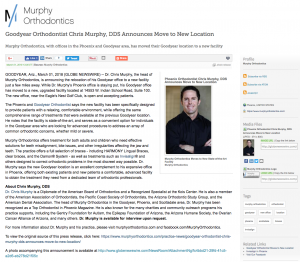 The head of Murphy Orthodontics in the Goodyear, Phoenix, and Scottsdale area, Dr. Murphy has been recognized as a Top Orthodontist in Phoenix Magazine. He is also known for the many charities and community outreach programs his practice supports, including the Gentry Foundation for Autism, the Epilepsy Foundation of Arizona, the Arizona Humane Society, the Ovarian Cancer Alliance of Arizona, and many others. Dr. Murphy is available for interview upon request. For more information about Dr. Murphy and his practice, please visit murphyorthodontics.com and facebook.com/MurphyOrthodontics.